ICC profiles for Epson 3800 and Inkrepublic inks? Discussion in 'Epson InkJet Printers' started by astecno, May 10, 2016. Recently I bought an Epson Stylus Pro 3800 that came with the Inkrepublic's CIS + irk4 nano inks and now I'm having a hard time trying to find ICC profiles for this combo. Except for the three profiles offered as download at Inkrepublic's website - Epson Premium Glossy, Semi Gloss and Ilford Pear - I haven't found anything else. I tried the Epson Premium Glossy profile offered by Inkrepublic and altough the print came beautifully and very close to my monitor (I mean: compared to the softproof after a careful calibration trying to mach ambient luminosity and white balance), magentas came oversaturated and blues a bit pale. So probably there is some mismatch between my inks and the canned ICC profile, which I believe can only be corrected by a custom ICC profile. Certainly I have plans to acquire a spectrophotometre to do my own paper profile. But first and foremost I have to save some more. 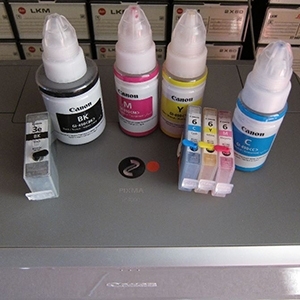 So I would like to ask you if is there any other source where I could find more ICC profiles for Epson 3800 and irk4 nano inks. Maybe some member could gently share a few custom profiles created for this combo. If you are not ready yet to create your own profiles you may need to contact a serivce provider to create a profile for you, most ink suppliers offer that service as well. Even if you have properly set up your monitor there may be limitations in the proof mode when the gamut of the display and the printer do not overlap in particular areas -e.g. when the gamut of the printer exceeds the gamut of the monitor in a particular color area which is quite possible. I might have some profiles for this. I used to have IRK4-nano inks in my old Epson Pro 3800, which I have sold. Please PM me for details. @Ink stained Fingers, I have not enough paper to justify a third party service. Actually all I have are just paper samples, no more than one or two sheets of different brands and papers that came with the printer (a mix of Epson, Ilford, Canson, Moab, Hahnmemuhle and some other brands). Certainly a service provider is going to be an alternative. It all depends on getting more confident about what to do and what to expect from this new printer. And also it depends on obtaining more paper!!! It should be noted that is my first printer and all my experience until now were based on online printer services and their minilabs. Printing at home is a completely new experience for me and I still feel amazed but also very scared in front of the printer! I have never thought about the printer gamut exceeding the monitor gamut. Honestly (and ingenuously), I had just assumed that the "97.1% coverage of AdobeRGB color space" (from my Nec pa271w bought second-hand but in very good shape), would simply overlap every corner of the printer gamut. I'm going to take your observation into consideration from now. Also I noticed that out-of-gamut colors are generally more saturated in the paper than the monitor. Maybe it was just a coincidence. But it also can be related to the way the printer deals with out-of-gamut colors. With minilabs I just desaturate those problematic colors a little bit, knowing the lab is going to push things up anyway. Unfortunately, I have no prior Epson experience to base any assumption from now. Dear @pharmacist, first and foremost thanks a million for the "big test of refillable Epson Pro 3800 cartridges + resetters" you wrote years ago! This post was one of the most important and crucial influencers in my decision to finally go on and buy a printer. Three years ago when I saw your post for the first time, I was completely lost and almost giving up due to the high cost of OEM inks associated to the lack of credible information regarding refillables. And despite having waited three years more to buy the printer, it was the discussion in this post that changed my mind. And thanks again for being so kindly about the ICC profiles! I will try to send you a message but I am not sure I will be able to. I can not see a PM option in your profile and I got an error when I try to start a conversation with you. So I think newcomers does not have the proper permission to send PMs until some forum lifetime. that monitor is a good one to start with, but please take all these marketing type promises and statements with a word of caution, those 97% can mean that the monitor just displays all AdobeRGB colors up to a limit of 99.9% of the max saturation, or it has a particular weakness just in a particular color range, but may even exceed AdobeRGB in other areas. You would know if you have NEC...icm profile data, and an icm profile of your printer/ink/paper and display them together for comparison. I have seen such data here in the forum but just cannot find it back at this time. What sofware would you need to display/overlay the icm profiles? If you are on Mac you can use the built in Color Sync Utility. For Windows Gamutvision can help, altough I believe any ICC/ICM viewer is able to at least compare a specific chosen profile to the standards like sRGB and AdobeRGB.